Starting from mid August, I was busy preparing the commencement of the academic year. Although I had a few stargazing activities, I didn’t have time to record what I have done. I did visual observation for the Jupiter opposition. I tried my friend’s Obsession 18” UC. I placed the telescope order for my school etc. I was lucky enough to have the full support from my principal that I can buy enough equipment to start astronomy in school. We bought a Sky-Watcher Equinox 120mm ED Refractor, a Sky-Watcher Dobsonian 12” Collapsible, Sky-Watcher EQ3Pro equatorial mount, Binoculars, The Imaging Source DBK 21 and DMK 41 etc. 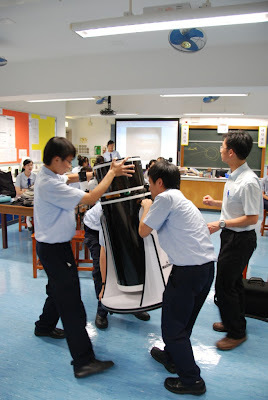 All the equipment enables me to start stargazing activities, promoting science education and enriching the NSS Physics teaching in Astronomy and Space Science. 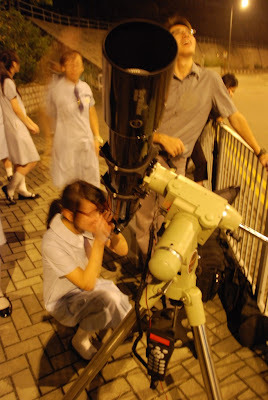 Last night was the first stargazing activity this academic year. I made an elegant Chinese name for this activity, 賞心「月木」Delighting Jupiter and Moon. I used the Stellarium to find out the appropriate time to hold this activity. It was because my school was surrounded by a public housing estate and a hill. The field of view from the school roof is very narrow. Without careful planning, the observation would definitely be doomed! 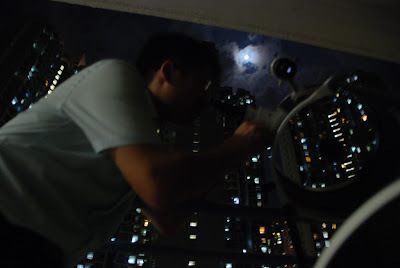 Originally I planned during the observation time, the Jupiter and the moon would appear between the gap of two buildings, finally I changed the observation site from the school’s roof to a nearby roundabout. I guessed students would be happier with an unobstructed view. After a short introduction about the Jupiter and the Moon, we went to a nearby roundabout. The transportation was easy as we had about 20 students. However, the setting was quite exhausting! The temperature was high and I needed to setup three telescopes. Finally I gave up and ended up with two refractors. You know I need to control and discipline about 20 students in the street and at the same time I needed to setup the equipment, it was really something! A few of my students were good. They asked if they could help. But I did not have enough time to train them about the setting. I dare not to let them do it! I don’t want to risk the expensive equipment. Well! I will train them afterward. Anyway, I finished the setting in wet! 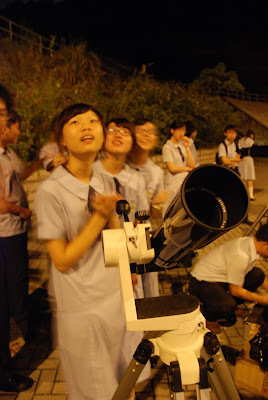 When I finished setting up the first telescope, Equinox 80ED, everyone was amazed by the Moon. This was the first time they saw maria and craters. The second wave came after the setting up of second refractor. The target was Jupiter. Everyone was shocked by the Jupiter and its 4 moons, Io, Europe, Ganymede and Callisto! This was the first time in their life that they had such a close contact with Jupiter! I was the prime master of climax! I deliberately increased the magnifications gradually. Every time when I boosted up the magnification, changed to a shorter focal length eyepiece, everyone was so amazed and excited! The only defect of the activity was that students needed to wait for a long time! 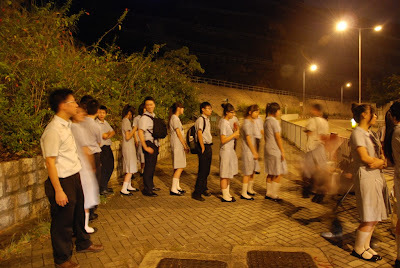 The queue was quite long! 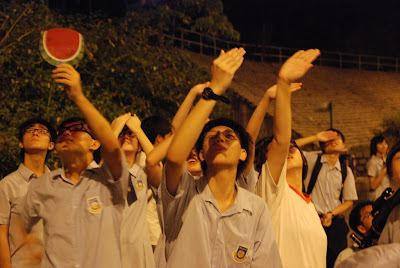 When it was about 9:30pm, a few students reported me that there were a few drops of rain! I was scared and packed all the telescopes at once. When we backed school, there was no rain at all! What a false alarm! 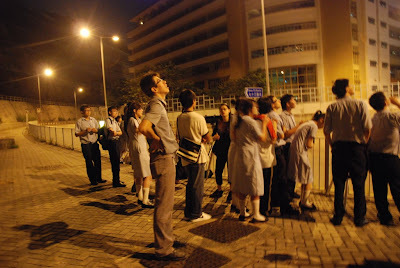 Some students were not very happy because they didn’t have a chance to look at the Jupiter! I promised them to organize anther activity shortly and they will have the first priority to join! After dismissing the students, I stated in the school and did some more observations with another Physics teacher in the school. We used the Sky-Watcher 12” Dobsonian and Equinox 120ED. Due to the light pollution, we only observed the Moon and Jupiter. Both seeing and transparency were modest. The magnification was about 200-300X. We were not able to explore the limit of these two telescopes. However, the primarily visual ability was good. A further test is needed. Top equipment, but hazy sky!